Yale is committed to being a community free of sexual misconduct. This website provides an overview of the University’s policies and the broad range of resources available to prevent and respond to sexual misconduct at Yale. Learn about your options and connect with the many resources ready to help. Find out how to report an incident, what to expect, and additional options. Access key resources and documents like policies, definitions, and reports. Learn about prevention strategies, advocacy, and ways to participate. 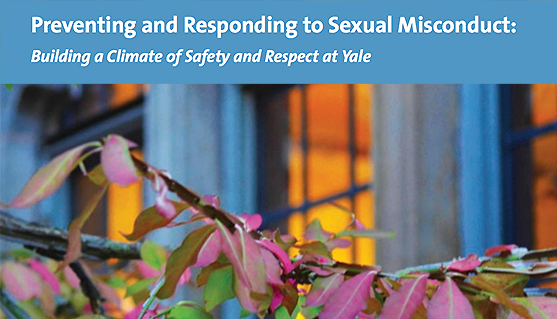 Preventing and Responding to Sexual Misconduct is required annual training for faculty, staff, trainees, and graduate and professional school students that outlines and explains Yale’s policies and definitions, campus resources, reporting mechanisms, and general strategies for prevention and response.